14 February 2018: news of a previously unknown record from China. 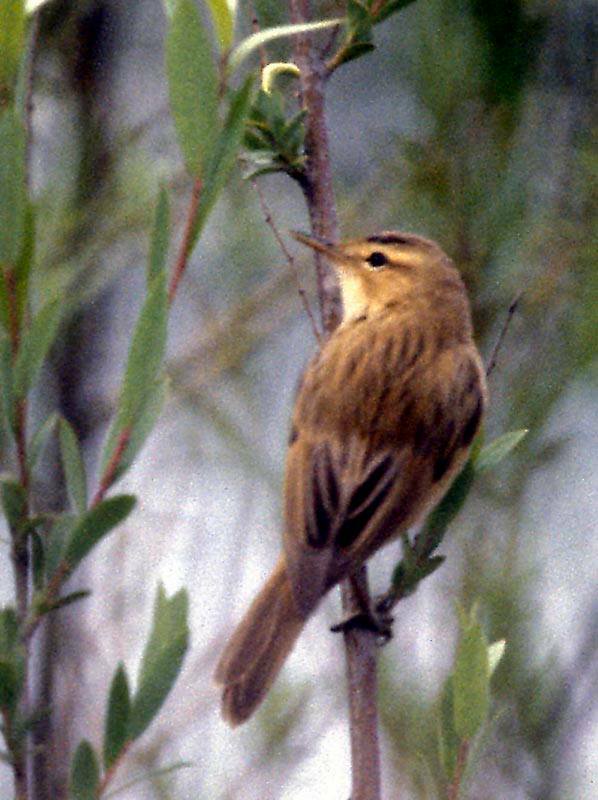 Apparently there is a specimen of a Streaked Reed Warbler at Shanghai Normal University, dated 12 October 1989 (Shanghai Wild Bird Society). 24 February 2015: thanks to Zhu Lei for sending me his photo of STREAKED REED WARBLER from Yuanmingyuan, Beijing, taken on 22 September 2008. 1 on 26 September 2015 at fishponds near Liaotieshan, Dalian, Liaoning Province, during a bird race as part of the 1st China International Birding Festival (Terry Townshend and Marie Louise). After scanning through the waders on the saltpans, one of the birding sites for the ‘bird race’, we were making our way south towards the exit, stopping frequently to scan and check out birds encountered along the track. I caught sight of a bunting sitting atop a reed and we stopped the vehicle to check it out. We quickly saw that it was a Yellow-breasted Bunting, a bird we had been lucky enough to see the previous evening. As we were all securing views through the telescope, I heard an ‘acro’ calling from the reeds… and as we had not yet seen Black-browed Reed Warbler, the species I was expecting based on the call, I decided to ‘pish’ to see whether the bird would show for the team. I said “this sounds a Black-browed Reed Warbler”… and, as I ‘pished’, I could see the stems of the reeds moving as the bird made its way towards me, still hidden. We were all waiting for the bird to appear and, suddenly, it climbed up a reed stem and there it was! I was eye-ball to eye-ball with a small ‘acro’, in full view, its back facing me and its head turned to the right. I could see rather subtle, but clear, dark (almost black) streaking on the mid-brown coloured mantle. There was streaking also on the crown and the head pattern was dominated by a white supercilium, bordered by black on the upper side. Marie was watching the bird, too, and was lifting her camera to take a record shot but as soon as we realised what we were looking at, it flicked right and dived into deep cover, showing a rich-coloured rump the warmth of which reminded me of Pallas’s Grasshopper Warbler. There was no doubt – we had just seen a STREAKED REED WARBLER! I blurted out “That was a STREAKED REED WARBLER!” Unfortunately Tianhou and Xi had not seen it and so we spent the next 30 minutes trying to secure another view and, hopefully, some sort of record image. I knew that, with a sighting of such a rare bird, we really should secure some evidence if at all possible.. The area of reeds was not large – only perhaps 10 metres x 2 metres – but despite a thorough search, we could not find it again. I had not seen it leave the reeds and I was confident the bird was still in the same patch. I put out the news and, given the proximity of several teams, up to 30 birders were on site within a few minutes. Paul Holt (who was one of the judges of the bird race and so not participating) was one of those on site quickly, accompanied by Ben Wielstra, and they both heard an ‘acro’ that could well have been the bird but after a short time the wind increased making it difficult to spot skulking ‘acros’ and, after a 3-hour vigil, there was no further sign. 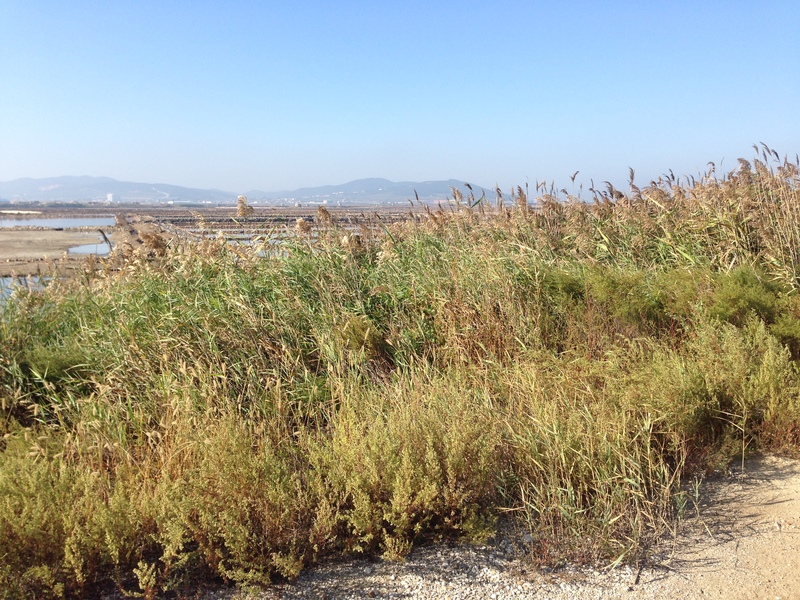 The patch of reeds in which the STREAKED REED WARBLER was found, near Laotieshan, Liaoning Province. 1 adult on 24 September 2014 near Tongzhou (SE Beijing), found by Paul Holt late morning and seen three times before 1300. Sadly not seen again, despite being looked for by TT (with PH) all afternoon/evening of 24th and most of the day on 25th. Heard to call and described by PH as “very similar to Black-browed Reed Warbler but possibly a little softer”. 1 on 15th June 2014 near Yanqing, Beijing (Li Haitou per Tong Menxiu). Searched for on 17/18 June with no success. 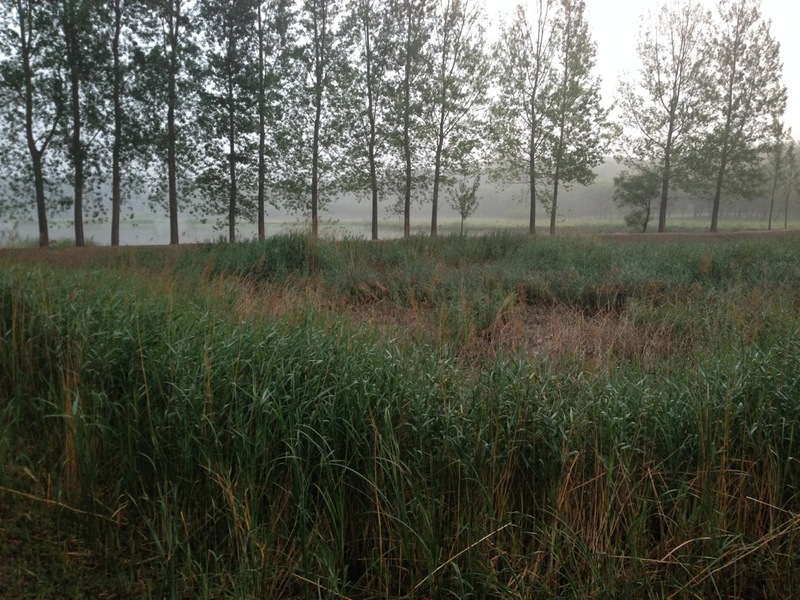 An abandoned fish pond: the site of the STREAKED REED WARBLER sighting in Beijing on Sunday 15th June 2014. 1 on 14th April 2013 at Dong-Ju, Matsu, Taiwan (per Birding Asia). Streaked Reed Warbler, Beidaihe, Hebei Province, China. Image by Dr Martin Williams. Streaked Reed Warbler (Acrocephalus sorghophilus) is a very rare passage migrant through Beijing with three, possibly four, late spring sightings and three, possibly four, autumn sightings. Its breeding grounds (presumably northeast China and southeast Russia) remain unknown and the only known wintering site – Candaba Marshes in the Philippines – apparently no longer supports this species. As far as I know, nobody has ever recorded its song. Streaked Reed Warbler has clearly declined alarmingly in the last century and, nowadays, isn’t recorded annually in the whole of China. Historically, from his studies around Qinhuangdao in coastal Hebei Province, La Touche (1920–1921) stated that spring passage in northeast China appears to take place in late May and the first week of June, and autumn passage from about 22 August to 7 September. Additionally, La Touche found it “common” in autumn 1912; and the following spring “a large number passed the port on migration at the end of May and beginning of June, and that year and the following the bird was common, as before, in the millet fields at the end of the summer”. Oddly, however, no records by Hemmingsen. All recent encounters in the capital have been with singles and have come from four sites – The Summer Palace, Old Summer Palace, The Olympic Forest Park and Wild Duck Lake. ** 1 at Wild Duck Lake on 18 October 2008. (Brian Ivon Jones – photo on Oriental Bird Images). Brian’s notes read – “It should be Black-browed but it had a very streaked upper back ruled out Zitting Cisticola, eye streak all wrong and the tail wasn’t rounded and didn’t have the white terminal bar, I initially decided it was Black-browed Reed Warbler. The buffy/yellow undersides are accurate. I am now confident from subsequent research that the bird I saw was indeed a Streaked Reed Warbler. There is no other warbler with a brown streaked head and upper back with this bird’s eyestripe, throat and underside colouration” (Brian Ivon Jones via BirdTalker). Unfortunately, however, the identity of the acrocephalus in the photograph cannot be confirmed. ** 1 at the Summer Palace, Haidian, Beijing on the 6 June 2009 (Paul Holt et al). ** 1 at Beidaihe, 1 June 2009 (Spike Millington and Brian Jones – see comment on http://www.birdingbeijing.com from Spike on 3 June 2013). Cai (1987) wasn’t certain about the status of Streaked Reed Warbler and wondered whether it was a migrant or a summer visitor. He had four specimens: birds that were collected at Dayouzhuang (then an eastern suburb of Beijing) on 28 May 1962 (this bird “was in good breeding conditional with swollen gonads”) and single birds collected at Sanhaizi, Nayuan on 11 September 1962, Shenshucun (like Sanhaizi also in Beijing’s eastern suburbs) on 25 September 1962 and Kangcun on 9 September 1964. Another bird collected [at an unspecified location in Beijing] on 10 June 1964 had very worn primaries and gave Cai (1987) reason to believe that it was ‘probably breeding’. Defined as being ‘common’ in the ‘Greater Beijing Area’ (i.e. Beijing, Tianjin and Hebei) during 1877-1938 by Chouteau et al (2012). Their data for this period was compiled from three sources: 1. David and Oustalet (1887); 2. David (1868); and 3. an unpublished manuscript found at the French ‘Congregation of the Mission’ in Paris, to which David belonged, and that also gave a list of birds observed in the Greater Beijing area. Defined as being ‘Extant’ in the ‘Greater Beijing Area’ (i.e. Beijing, Tianjin and Hebei) during 1938-1977 by Chouteau et al. (2012). Their data for this period was compiled from two sources: – 1. Shaw (1936); and 2. Wilder and Hubbard (1938). Defined as being ‘Extinct’ in the ‘Greater Beijing Area’ (i.e. Beijing, Tianjin and Hebei) during 2004-2007 by Chouteau et al. (2012). Their data for this period was compiled from two sources: their personal observations; and 2. data from the 2004-2007 China Bird Reports. Hat tip to Paul Holt for much of the information included in this page. Thank you also to Dr Martin Williams for use of the image of Streaked Reed Warbler at the top of this page and for additional records and information. Please contact Birding Beijing if you have any information or details of sightings to add to this page.